An experienced facilitator will assist your team to capture ideas from a user/customer perspective. We believe all ideas are good ideas - even the wild ideas. Design-thinking workshops can range from product strategy innovation, to creative brainstorming, to user-centered problem solving. "Sometimes it's helpful to have an unbiased person facilitate a brainstorming session"
Help your team to stimulate creative, innovative ideas. The activities within these workshops can help to challenge the status quo. Workshops can be conducted virtually or on-site. An off-site brainstorming workshop focused on innovative and creative ideas, located in beautiful Downtown San Diego, California. Think of it as an "innovation vacation." For the creative and innovative ideas to start flowing, you need to get outside of your office and away from your daily tasks. An experienced facilitator will assist your team to capture ideas for your new product. We believe all ideas are good ideas - even the wild ideas. Then, we can help your team to determine which concepts to focus on first. This package does not include expenditures for room location, nor materials/supplies. Travel and lodging, if needed, to be additionally quoted and billed. Scheduled on a first-come, first-serve availability. Is your team looking to add new enhancements to existing product? Technology should always be evolving. This workshop will assist your team through an ideation process to think of taking your existing product to the next level. Need to help your team in getting the creative ideas flowing? This innovation workshop will help to challenge the status quo. Focused on marketing and website experiences for prospective customers and current customers, the activities of this workshop can help to look at the perspectives of your future customers as they gain awareness of your organization's offering from prospect to purchase. 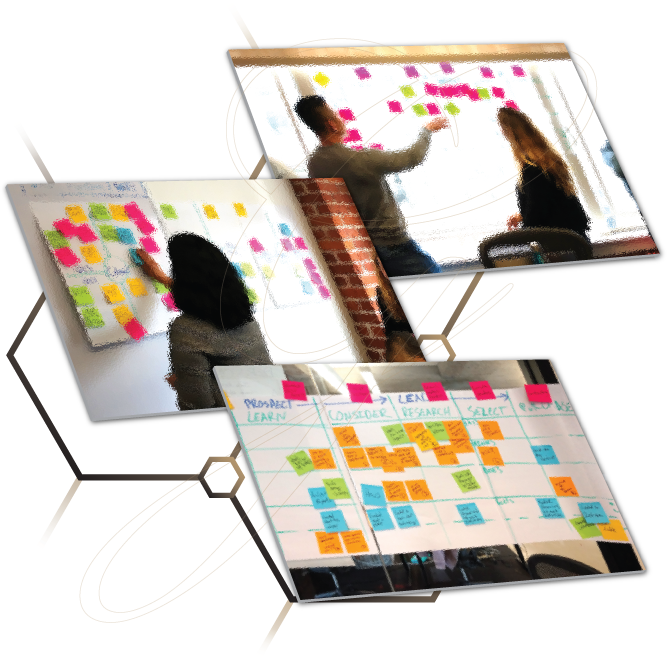 Custom-tailored for your team, this design-thinking workshops can range from product strategy innovation, to creative brainstorming, to user-centered problem solving.